And that’s exactly what happened the evening we devoured these mini coconut pies. We had more than a birthday to celebrate that night. We lost track of time when we discovered that the little ones are now old enough to play by themselves after dinner instead of climbing all over their parents or grandparents. Definitely a cause for celebration. Join me in celebrating another milestone. This is my 200th post! My little blog that began simply as a way of keeping track of my Christmas baking recipes has mushroomed and now includes 200 recipes with everything from my favourite cookies to this, the post that was the most difficult to write. These delectable little tarts do not meet the criteria I strive for, which is to include recipes that are healthy and use as many fresh local ingredients as possible. But they taste good. And sometimes when we lose track of time while celebrating with family and good friends, that’s all that seems to really matter. Put flour and salt in food processor and pulse. Cube butter, then add to flour in processor bowl and pulse until it resembles coarse meal. Add vinegar to milk. Add all at once to flour mixture. Pulse until it just forms a ball. Remove and divide into two balls. Place on waxed paper or plastic wrap, flatten gently into a disc, top with another layer of wrap, fold over and refrigerate if not using right away. This is a reliable recipe that is true to its name: Never Fail Pastry. Roll out and cut to fit your tart or mini muffin pans. Press gently into tins, smoothing out any creases. Prick several times with the tines of a fork. Bake in a preheated 375F. oven for about 12 – 15 minutes or until golden brown. In a medium saucepan, bring coconut milk, milk, 3 tablespoons of the sugar, shredded coconut and salt to a gentle simmer. In a bowl, whisk together the egg yolks, 2 tablespoons plus 1 teaspoon sugar and cornstarch until smooth. Carefully temper the egg yolk mixture by very slowly whisking in the heated coconut and milk mixture. Whisk constantly so the eggs don’t congeal. Pour the whole mixture back into the sauce pan and whisk constantly over medium heat until he mixture begins to thicken, about 1 minute. Add the cubed butter and vanilla and whisk until smooth. Immediately remove from heat, pour into a clean bowl and press plastic wrap on to the top to prevent a skin from forming. Refrigerate for at least an hour. Whip the cream with the icing sugar and the flavourings until soft peaks form. Toast the shredded coconut by spreading in a single layer on a baking sheet and placing in a pre-heated 400F. oven for about 5 minutes or until it just starts to brown. Remove quickly as it will continue to brown after it has been removed from the oven. 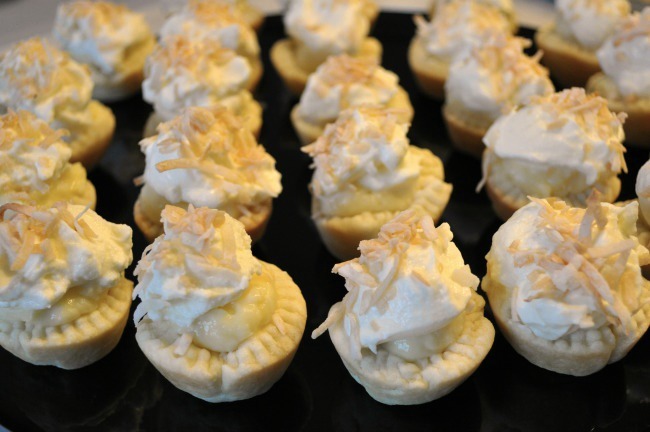 Assemble the tarts by piping or spooning the coconut cream into the cooled and baked tart shells, pipe or spoon the whipped cream topping on top and garnish with the cooled, toasted coconut. Chill and serve within an hour or two. 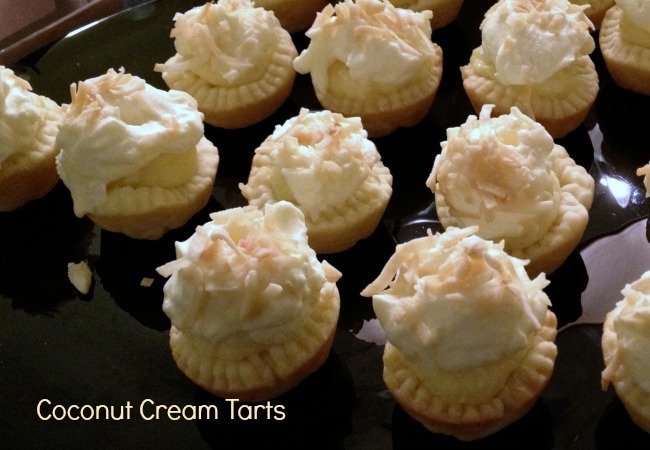 This entry was posted in desserts and tagged coconut cream pie, coconut cream pie made with coconut milk, coconut milk dessert, coconute cream mini pie, mini desserts. Bookmark the permalink.